We will be holding a jumble sale to raise funds for the Society at Ringmer Village Hall. Sorting is from midday, with doors open to the public at 2pm. If you'd like to help, then simlpy turn up on the day. There is plenty of parking and any help is greatly appreciated. Sorting is from midday, with doors open to the public at 2pm. If you'd like to help, then come lend a hand. 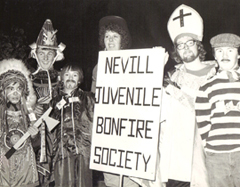 Nevill Juvenile Bonfire Society are delighted to announce we will hold Our Night on 16th November 2019. Two torchlit processions being led by the Society Banners, followed by our pioneers, smugglers and blazing tar-barrels will march through the streets of the Nevill Estate, Lewes. The Society will then process up to the firesite, on Landport Bottom, where we will light our blazing bonfire. Following an address by our clergy we will then further light up the Sussex night sky through the destruction of the effigies and a grand firework display. A third, and final, procession will head back to headquarters at St Mary's Supporters Club where we will sing Bonfire Prayers.